First of all, you really have to look at the cost of hosting. It goes way beyond the couple thousand dollars you could spend on a server. Yes, you do have to buy a server. No, we wouldn’t recommend buying something off of eBay, repurposing your receptionists computer, or buying a server off your brother-in-law who got it at a going out of business sale. If you have more than 5 ACT! users, we would recommend ACT! have its own server. Think of ACT! as your teenager, you really don’t want it to share a room with others unless absolutely necessary. That server will be housing a critical company asset, your database. You need to have a server Operating System, that is the system on which your server will operate. If you have sync or web users, you’ll need to configure IIS and ASP.NET on that server. If any web users, you should have a backup ISP in case your main internet provider goes down. What if the power goes out? Do you have backup power? We are now talking about a web server, if you hadn’t guessed. That server will have to see the outside world via a dedicated IP address, which means you’ll want it secured by a Firewall appliance. You’ll need anti-virus software to make sure it is safe from the bugs out there. 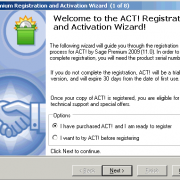 So far, you need to buy a server, a server operating system, configure your services, and we haven’t even installed ACT! yet. Oh, and don’t forget about backing up the server. It’s great if you use your ACT! 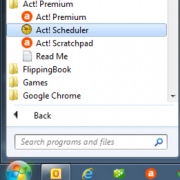 Scheduler to create the backup, but if that just hangs out on the server itself, and the server crashes, you have no ACT! and no ACT! backup. So, things are adding up. But, let’s just say you get all the “stuff” you need to host the database internally. Who is going to take care of that machine, the database, and the users? Because, your users are going to have machines, those machines will need databases. Those machines will get Starbucks spilled in them and need to be replaced and get new databases. You’ll need someone to manage that. Our customers’ database admins range from an assistant with a solid computer skill set to an IT team member. Your database admin can expect to devote about 20% of their time to ACT! once things are running smoothly. That percentage is higher in the beginning phases, and higher the larger your ACT! user team. The alternative is Hosting. Just so happens, wink wink, we are ACT! Hosting pioneers! For $30/user/month, you outsource that entire headache. We have the servers, an entire Data Center full of them in fact. We have all the fancy backup power supplies that could keep your database juiced for seven days, should the power go out. Redundant internet providers are built in, so you can rest assured you have access to your database. To keep your database safe and sound, we back everything up, both on and offsite, nightly. Creating new databases to rescue the Starbucks spillers, setting up new users, answering your questions, and more, we do that too. Don’t forget, we are ACT! experts so you know your data is in good hands. Think about how much it would really save you, in those priceless elements, if you chose ACT! hosting. ACT! Mail Merge Made Classy I just got my new Mac and I need to install ACT!